For 2018, NYCxDESIGN is pleased to have Swiss watchmaker, Rado, return as the Official Watch Sponsor of NYCxDESIGN. 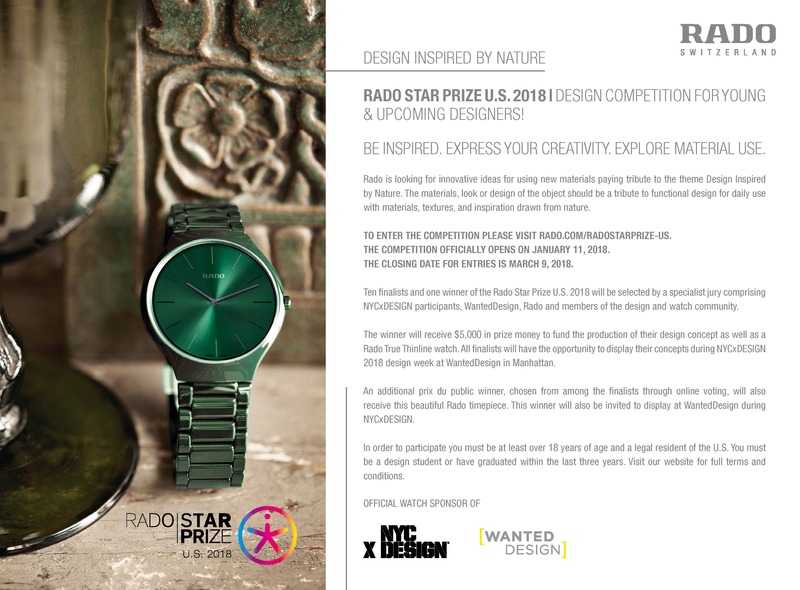 As part of its participation, Rado will host the third stateside edition of the Rado Star Prize together with WantedDesign. This year’s theme will focus on the concept of “Design Inspired by Nature”- a theme that hopes to explore the influence nature can have on design. The call for entries for the competition opened January 11, 2018, on the Rado Star Prize website (www.rado.com/radostarprize-us), and closes on March 9, 2018. The winner and the other 9 finalists will be showcased at WantedDesign Manhattan. More information and application form can be found at http://radostarprize.rado.com/us.